Schwannomas are usually benign tumors arising from Schwann cells of the peripheral nerve sheath. Most schwannomas are benign, although malignant cases are known to occur. Retroperitoneal schwannoma is a rare entity comprising only 0.5% to 12% of all retroperitoneal tumors. In the retroperitoneal position, they occur most commonly between 40 and 60 years of age, with a male/female ratio of 2:3. We present GC, a 78 year old female with an incidental finding of a retroperitoneal mass found 10 years ago on an abdominal CT scan performed secondary to a motor vehicle collision. On physical exam her abdomen was soft, nondistended, minimal infraumbilical tenderness and a large infraumbilical mass, well circumscribed, immobile was palpated. Abdominal CT scan showed a 7.2 cm x 7 cm mass located at the Aorta-Iliac bifurcation. PET CT showed uptake at the retroperitoneal lesion. Recent follow up CT scans showed increase in size of the retroperitoneal mass, but the patient has remained asymptomatic from that standpoint. 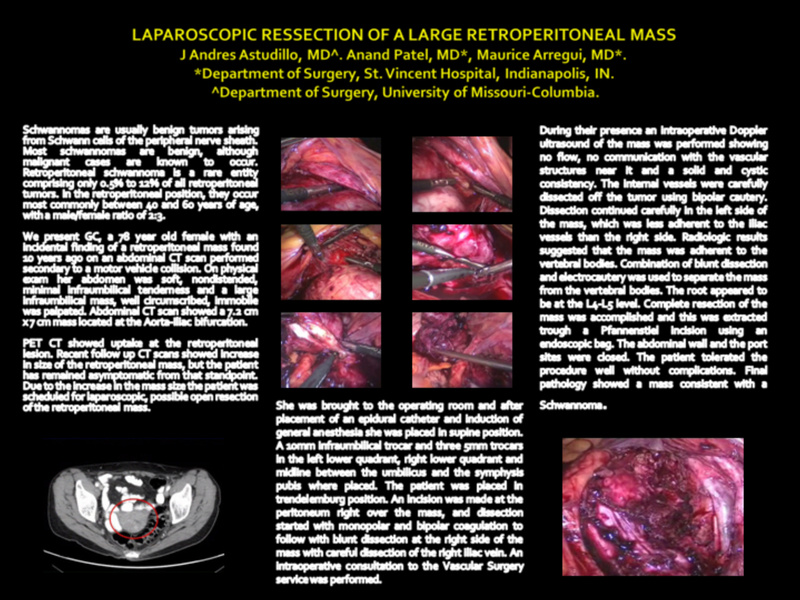 Due to the increase in the mass size the patient was scheduled for laparoscopic, possible open resection of the retroperitoneal mass. She was brought to the operating room and after placement of an epidural catheter and induction of general anesthesia she was placed in supine position. A 10mm infraumbilical trocar and three 5mm trocars in the left lower quadrant, right lower quadrant and midline between the umbilicus and the symphysis pubis where placed. The patient was placed in trendelemburg position. An incision was made at the peritoneum right over the mass, and dissection started with monopolar and bipolar coagulation to follow with blunt dissection at the right side of the mass with careful dissection of the right iliac vein. An intraoperative consultation to the Vascular Surgery service was performed. During their presence an intraoperative Doppler ultrasound of the mass was performed showing no flow, no communication with the vascular structures near it and a solid and cystic consistency. The internal vessels were carefully dissected off the tumor using bipolar cautery. Dissection continued carefully in the left side of the mass, which was less adherent to the iliac vessels than the right side. Radiologic results suggested that the mass was adherent to the vertebral bodies. Combination of blunt dissection and electrocautery was used to separate the mass from the vertebral bodies. The root appeared to be at the L4-L5 level. Complete resection of the mass was accomplished and this was extracted trough a Pfannenstiel incision using an endoscopic bag. The abdominal wall and the port sites were closed. The patient tolerated the procedure well without complications. Final pathology showed a mass consistent with a Schwannoma.